China confirmed Thursday that it will demand rich nations cut greenhouse gas emissions by 40 percent from 1990 levels by 2020 in upcoming global climate change negotiations. In a position paper published for negotiations to be held in Copenhagen in December, China — one of the world’s largest emitters of greenhouse gases that cause global warming — did not commit to any legally binding reductions. “Developed countries shall undertake to reduce their GHG (greenhouse gas) emissions in aggregate by at least 40 percent below their 1990 level by 2020,” said the paper, posted on China’s planning agency’s website. The call for a 40-percent cut by rich countries has previously been mentioned in state media, but Thursday’s document spells out the demand as official Chinese government policy. The December negotiations are aimed at hammering out a new climate change pact to replace the Kyoto protocol that expires in 2012. The European Union has said it would slash emissions by 20 percent by 2020 compared with the 1990 level and raise the target to 30 percent if others set similarly ambitious targets. State press reports earlier said China was prepared to commit to improved energy efficiency as its contribution to the talks, but such targets were not set out in the position paper. The energy-guzzling nation pledged four-percent annual cuts in the amount of energy used per unit of gross domestic product from 2006-2010, but so far those targets have been missed. Developed nations must also ramp up funding for clean energy technology to developing nations, the position paper said. As a developing nation China under Kyoto did not accept cuts in greenhouse gas emissions, which are blamed for global warming, higher sea levels and other potentially disastrous changes in the climate. “Fully aware of the seriousness and urgency of climate change and with a deep sense of responsibility for the long-term development of mankind, China is firmly committed to sustainable development,” the position paper said. A two-state solution to the conflict between Israel and the Palestinians could diminish the existential threat posed by Iran, U.S. National Security Advisor James Jones said in an interview aired on the network ABC on Sunday. The interview aired just over a week before Prime Minister Benjamin Netanyahu was scheduled to arrive at the White House for talks with U.S. President Barack Obama. “We understand Israel’s preoccupation with Iran as an existential threat. We agree with that. And by the same token, there are a lot of things that you can do to diminish that existential threat by working hard towards achieving a two-state solution. This is a very strategic issue. It’s extremely important. And we’re looking forward to having a good, constructive dialogue with our Israeli friends when they visit Washington in the next seven or eight days,” Jones concluded. The U.S. shouldn’t dictate to Israel how to proceed with a two-state solution to resolve the Israeli- Palestinian conflict, instead allowing Prime Minister Benjamin Netanyahu’s administration flexibility to proceed in its own, Senator John McCain said. “I’m not sure the timing is right, right now, with a new government in Israel, for us to dictate to them their policy,” McCain, of Arizona, said today on ABC’s “This Week.” The U.S. should help “push the entire peace process forward,” said McCain, the senior Republican on the Senate Armed Services Committee. Netanyahu, who took office March 31 and will visit Washington later this month, last week outlined his “triple track” approach of pursuing political, security and economic progress for the Palestinians to the annual policy conference of the American Israel Public Affairs Committee in Washington yesterday. He spoke via satellite from Jerusalem. Iran will turn to China instead of Russia to acquire an advanced air defense system after relations between Iran and Russia hit rock bottom, the official Iranian news agency PressTV reported. For years Iran has been trying to purchase the S-300 anti-aircraft missile, which is considered to one of the most advanced systems available on the market and would dramatically increase Iran’s air defense capabilities against any attacks on its nuclear installations. The S-300 surface-to-air missile system, which can track targets and fire at aircraft 75 miles away, features high jamming immunity making it harder to incapacitate the system electronically, and is able to engage up to 100 targets simultaneously. Teheran will now turn to China for the HongQi-9/FD-2000 system which reportedly combines elements “borrowed” from the Russian S-300 and the American MIM-104 Patriot system, according to the Iranian news agency. Israel is worried about Iran’s nuclear development effort, the work of Russia and China to block effective U.N. sanctions against Iran for its nuclear program, and the “unknowns” of the American President. The UN has accepted Pakistan’s claim to extend its\ maritime exclusive economic zone to 350 nautical miles from 200 nautical miles. Addressing a news conference here Wednesday, Federal Minister for Science and Technology, Azam Khan Swati said Pakistan filed its case at the UN on 30th of the last month and it got the historic success two day ago. After the UN acceptance, Pakistan will have right on all the resources of this additional maritime zone. He said under the UN laws a complete survey of the area was conducted which indicates that Pakistan will get economic benefits from this extended maritime zone. This will enable Pakistan to explore petroleum and mineral resources in general and benefit the offshore maritime industry and market in particular. The Federal Minister said that only twenty nine countries of the world have so far availed the right to file case in the UN. Earlier, Pakistan’s Permanent Mission to the United Nations in New York filed the claim to United Nations Commission on the Limit of Continental Shelf( UNCLOS) for extension of its continental shelf to 350 nautical miles from the present 200 nautical miles. The Ministry of Science and Technology (MoST) was involved in the preparation of the claim for the last couple of years. The National Institute of Oceanography (NIO), an autonomous organization of the Ministry was entrusted the task to prepare the claim in accordance with the UN requirements. The case was prepared and submitted to Pakistani Mission in New York during April 2009 for submission before the deadline of 13th May 2009. The Pakistani Mission filed the claim on 30th April 2009. The United Nations Convention on the Law of the Sea (UNCLOS) was adopted in 1982 and came into force on 16 November 1994. Pakistan ratified the Convention on 26 February 1997. The Convention entered into force for Pakistan on 28 March 1997. Under the UNCLOS, Pakistan presently has an Exclusive Economic Zone (EEZ) extending up to 200 nautical miles which would be extended up to 350 nautical miles on meeting some conditionalities. Therefore, recognizing this and taking opportunity of UNCLOS Article 76, MoST has been endeavoring to address and pursue this extremely important issue of national interest, to have Pakistan’s Continental Shelf extended from 200 to 350 nautical miles. Pakistan would accrue substantial benefits from the extension as vast area of more than 50,000 km may be gained after the continental shelf extension. The data acquired during the project will provide a reliable and firm database and foundation, essential for future marine research and exploration of living and non-living marine resources. It will also provide ‘a good basis for our scientists/ technicians to further promote and develop the marine geological and geophysical research and survey capabilities. Policy disputes, often bitter, are the stuff of democratic politics. Elections settle those battles, at least for a time, and Mr. Obama’s victory in November has given him the right to change policies on interrogations, Guantanamo, or anything on which he can muster enough support. But at least until now, the U.S. political system has avoided the spectacle of a new Administration prosecuting its predecessor for policy disagreements. This is what happens in Argentina, Malaysia or Peru, countries where the law is treated merely as an extension of political power. Is Obama Climate Change Policy Driven by Top U.N. Officials? After he was elected president, he made Susan Rice his Ambassador to the United Nations. Susan Rice is an affirmed internationalists. She apparently believe that groups like the United Nations should influence, in fact, in some cases direct, U.S. policy. That’s the same United Nations that allowed Iran’s President Ahmadinejad to unleash a hate filled attack on Isreal and the United States today. Many have been watching the United Nations vis a vis Obama policy and on the issue of climate change policy there are some danger signals…. A greenhouse gases trading system funded with the support of then-Illinois State Sen. Barack Obama, which is likely to play a major role in his $650 million cap-and-trade initiative, lists five present or former top-ranking U.N. officials on its advisory board who’ve had enormous influence over climate change matters — including one who received $1 million from a convicted South Korean lobbyist. The most controversial figure of the five, Maurice Strong, was one of former Secretary General Kofi’s key aides at the U.N. for years until the Iraq Oil-for-Food scandal forced him to leave. Since then Strong has lived mostly in China. Calls to the exchange for comment about Strong’s role, and that of other U.N. figures, were not returned. The Climate Exchange, which began operations in 2003, provides trading in carbon emissions and their offsets, along with those of other greenhouse gases, is among a group of companies and institutions that voluntarily participate in the program. It bills itself as the only voluntary, legally binding exchange of its kind in North America. Among its member companies are Ford, DuPont and United Technologies as well as a number of electric utilities; other participants include the City of Chicago and Miami-Dade County. In the latest budget submitted to Congress last month, President Obama proposed backing cap and trade as the nation’s primary response to reduce global warming; a bill with that aim has also been submitted in the House of Representatives. Under the cap and trade plan a fixed number of carbon producing “permissions” would be made available to manufacturing and other industries each year; the totals would be reduced over time, forcing down the overall total of carbon dioxide emissions. To meet their targets, companies would either have to cut production of the offending carbon-based gases or buy “offsets,” or credits from companies that do not reach their allowed levels or actively create projects that reduce carbon in the atmosphere. Offsets also include planting trees and other activities that remove carbon from the atmosphere. However it is used, the scheme is guaranteed to boost the cost of fossil and other gas producing forms of energy in the U.S., as well as the costs of every economic sector that relies on that energy. The likelihood of cap and trade or a similar scheme being enacted got a significant boost last week, when the Environmental Protection Agency officially announced that greenhouse gases pose a threat to public health and welfare via global warming, a prelude to official regulation of the emissions. The Chicago Climate Exchange is the brainchild of Richard Sandor, an economics professor who has worked for the both the Chicago Mercantile Association and the Chicago Board of Trade. Known as “Mr. Derivative,” for his work in creating interest rate futures markets, Sandor first proposed the creation of the climate exchange in 2000, just before the signing of the Kyoto Accord on greenhouse gas reduction. Initial funding of almost $1 million which was crucial to the exchange’s launch came in 2000 and 2001 from the Chicago-based Joyce Foundation, whose board of directors, which approved the funding, included Barack Obama, then an Illinois state senator. Click here to read about Obama’s early connections to cap and trade. Paula DiPerna, the Joyce Foundation’s president at the time funding was approved, became the Climate Exchange’s vice president by the time the foundation gave a second, and larger, tranche of money to the budding venture. Barack Obama, by that time an Illinois state legislator, was still on the foundation board. On one level Strong’s involvement in the exchange is not surprising. He has been a player in virtually all the U.N.’s environmental initiatives over the past four decades. His work includes organizing the 1972 U.N. conference on the environment in Stockholm, which was a launch pad for the worldwide environmental movement, as well as the 1992 Earth Summit and the Kyoto Accords. The New York Times once called Strong, a native Canadian, “The Custodian of the Planet.” In 1972 Strong also became the first head of the United Nations Environmental Program. In 1997, he helped Annan launch a program of internal reform of the U.N., and subsequently served as Annan’s special envoy to North Korea. Strong left the U.N. under a cloud in 2005, after an investigation into the corruption ravaged Oil-for-Food Program revealed that he had received nearly $1 million in cash from Tongsun Park, a South Korean businessman who was later convicted of conspiring to bribe U.N. officials who ran the program. Strong claimed that the money was an investment by Park in a company owned by Strong’s son. He admitted personally taking other money from Park but claimed it was for an “office rental.” After the revelations Strong resigned his last U.N. post as Annan’s North Korea envoy and moved to China. Contacted to comment on his involvement in the exchange, Strong originally agreed to accept a list of questions from FOX News. However, after receiving the e-mail, he failed to respond. Among the questions: What was his role on the advisory board? Because President Obama was involved in the early funding of the exchange, did he meet with members of the exchange? Is Strong involved in setting up a similar exchange in China? The Climate Exchange’s 18-member advisory board is made up of leaders in business, science and academia. According to interviews with members who cooperated more than Strong did, membership is an unpaid position and the advisory board rarely meets. It was originally used to advise the company on “procedures and standards,” such as calculating carbon emissions and setting prices, when the company was being formed, according to one participant. Today most of the advisory board’s work is done over the phone on an as-needed basis, according to a board member. Also on the board of advisors is another Canadian and close associate of Strong’s: Elizabeth Dowdeswell, another former head of the United Nation’s Environmental Program who is remembered for leading the organization into the deepest crisis in its history during her five-year tenure from 1993 to 1998. In 1997, the State Department charged that the UNEP under Dowdeswell’s tenure suffered “from a lack of focus, strategic vision and influence.” It also charged that the organization had been “marginalized to a perilous extent.” As a result of the crisis of confidence in her leadership both the US and Britain threatened to withhold funding from the organization. Dowdeswell, a former school teacher and home economist, was also attacked by environmentalists, financial donors, governments and her own staff for inept management that left the agency “irrelevant,” according to critics. In response to the firestorm of criticism Dowdeswell announced that she wouldn’t seek a second term in the UNEP position. Her record shows that she has often followed in Strong’s footsteps. She spent much of her early career as a Canadian bureaucrat in the environmental field dominated by Strong. Her public career began as Saskatchewan’s deputy minister for youth and culture and later Canada’s deputy assistant minister of Environment. From there she followed Strong to the United Nation’s Environment Program as executive director, a post that Strong had created and previously held. She was involved with him in organizing the Rio Summit. Dowdeswell was also sent a list of questions about her involvement with the Chicago Climate Exchange. She has not responded. Another member of the advisory board is Rajendra Kumar Pachauri, who has headed the U.N.’s Intergovernmental Panel on Climate Change since May 2002. The panel was co-recipient, with Al Gore, of the Nobel Peace Prize in 2007 for bringing global warming to the top of the world’s agenda. The panel’s reports over a 10 year period tracked scientific studies and in 2007 concluded that the weight of scientific evidence now showed not only that global warming was occurring, but that it was a man-made phenomenon and that its consequences were immediate and dire. The reports have become the basis for all the proposals to bring about drastic reductions in man-made greenhouse gases, starting immediately. But the panel’s conclusions did not come without major controversy. The IPCC reports, compiled by hundreds of scientists around the world, were meant to provide definitive up-to-date answers to questions about global warming based on current scientific data. Yet when the reports were issued, a number of scientists who had contributed to them challenged the conclusions. They charged that Pachauri, who is an economist and industrial engineer and not a climate scientist, had written the final draft of the report in collaboration with other political figures before it was released, adding errors and unsubstantiated conclusions. The critics also charged that he had over-stepped the mandate of the IPCC by advocating policy, something the panel was supposed to avoid. In January 2005 Chrisopher Landsea, a leading hurricane expert with National Oceanic and Atmospheric Administration resigned from work on the IPCC report, saying that it was “both being motivated by pre-conceived agendas and being scientifically unsound.” He said that the panel had deliberately linked recent hurricane severity with global warming when no scientific link had been established. Pachauri is enthusiastic about his involvement with the Chicago exchange. “I believe the exchange has an extremely important role in view of President Obama’s inclusion of cap and trade in the new budget. I see it emerging as the principal market in the U.S. and beyond when cap and trade becomes a reality,” he said in response to questions submitted by FOX News. “The UN security council has stabilized this occupation regime and supported it in the last 60 years giving them a free hand to continue their crimes,” Ahmadinejad said. UN chief Ban Ki-moon condemned Ahmadinejad for his tirade against Israel. “Such outrageous anti-Semitic remarks should have no place in a UN anti-racism forum,” said British ambassador Peter Gooderham, whose country chose not to send a minister to Geneva. Ahmadinejad’s speech also took aim at the United States for its role in the global economic crisis and at Western countries for imposing unfair economic conditions on the developing world. Among his more brazen claims was the allegation that Zionists instigated the 2003 U.S.-led invasion of Iraq in concert with weapons manufacturers. Iran’s state TV broadcast pictures showing some delegates cheering and other delegates leaving the conference. “The president confidently continued his speech despite efforts by some Western diplomats to disrupt his address,” it said. President Barack Obama isn’t the only one in the world saying the United States is responsible for most of the world’s problems…. 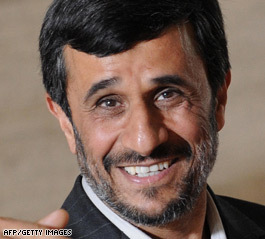 “Those in authority at the time set off two world wars,” Ahmadinejad said, in an accusation directed at Western powers. Ahmadinejad went on to accuse those powers of “killing hundred of millions of people and causing mass destruction” also in Africa and Asia. At this point the Iranian president’s speech moved to the subject of Israel and the Palestninians. “The Security Council made it possible for that illegitimate government to be set up. For 60 years, this government was supported by the world. Many Western countries say they are fighting racism; but in fact support it with occupation, bombings and crimes committed in Gaza. These countries support the criminals,” Ahmadinejad said. “Governments must be encouraged and supported in their fights at eradictating this barbaric racism. Efforts must be made to put an end to Zionism,” he said. As he spoke, France walked out of the room in protest. Some twenty delegates were seen leaving the room. 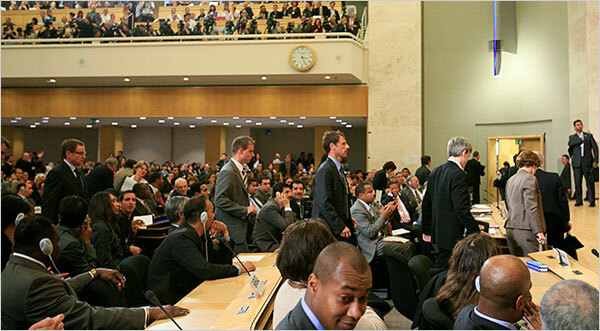 Still, the majority of the delegates greeted Ahmadinejad with a round of applause. Ahmadinejad also blamed Israel for America’s invasion of Iraq, which he said benefited Israeli arms sales. Is President Obama Madonna, Bono or the Commander in Chief of the World’s Greatest Democracy? This morning the Israeli Prime Minister, Binyamin Netanyahu, told his Cabinet that while Israel commemorates the six million Jews slaughtered by the Nazis, “in Switzerland, the guest of honour is a racist and a Holocaust-denier who doesn’t conceal his intention to wipe Israel off the face of this earth”. Iranian President Mahmoud Ahmadinejad unleashed a blistering attack Monday against Israel and the United States, calling the Jewish state “racist” and lashing out at Americans for their support. He followed by blaming the United States, Europe and Israel for the world’s financial crisis. Protestors stormed the stage when Ahmadinejad began speaking and several Western delegates walked out of the room after the Iranian president said Israel was created on the “pretext of Jewish suffering” from World War II. A wigged protester shouting “Racist! racist!” threw a soft red object at Ahmadinejad, hitting the podium and interrupting his speech. Meanwhile, U.N. Secretary-General Ban Ki-moon urged the world Monday to rally against the threat that intolerance could rise as a result of the economic crisis, saying “the time is now” to stamp out racism. Ban, opening the global body’s first racism conference in eight years, said racism including anti-Semitism and Islamophobia needed to be tackled. “I fear that today’s economic crisis, if not handled properly, could evolve into a full-scale political crisis marked by social unrest, weakened governments and angry publics who have lost faith in their leaders and their own future,” the U.N. chief said.